So, how can you tell if you have low indoor air quality in your home? Bad Allergies: Don’t write off all your symptoms as fall allergies. If you have headaches, sneezing, watery eyes, coughing, or any of these symptoms, it’s a sign that you have low indoor air quality in your home. Hot and Cold Spots: Notice that some parts of your home stay freezing all day long while others always seem to remain stuffy? Contaminants accumulating in your ductwork obstructing the flow of air often causes this. Lots of Dust: Do you dust off all the surfaces in your home, come back a few days later, and notice that all the dust has settled on these surfaces yet again? It’s frustrating problem that seems like it can’t be solved. Some of these contaminants are hard to avoid, so it’s important to have cleaning services provided by a professional team like ours. If you allow these contaminants to remain in your home endlessly cycle through your HVAC system then you’ll experience the uncomfortable home conditions, bad allergies, worsened colds, and many other symptoms. You should schedule duct cleaning in your home because it will remove all the contaminants from your system. Removing all these contaminants helps in a myriad of ways. It frees up space in your system so that your heater and air conditioner will perform more efficiently and effectively, improve your home’s comfort, and improve your air quality so that you’ll breathe much easier. You need a professional to perform these services because it’s not really possible to do on your own. 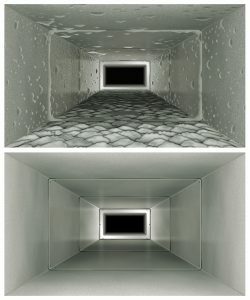 Your air ducts are out of sight and out of might and require a certain level of expertise to navigate. If you’re looking to have your ducts cleaned here in Boerne, then contact Cowboys Air Conditioning & Heating today to schedule an appointment.